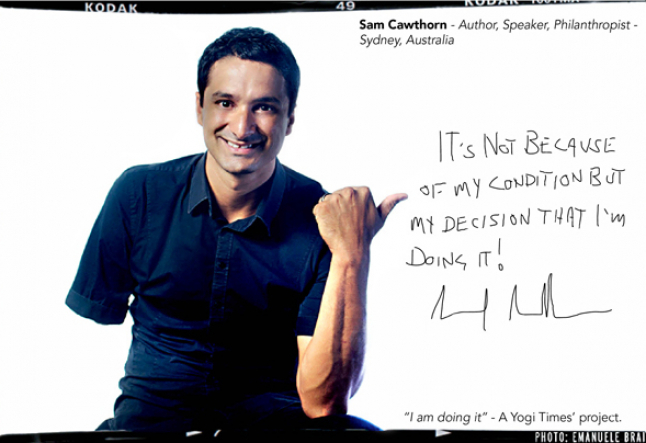 Sam Cawthorn is an Australian motivational speaker, philanthropist and self-help author. His work has inspired and helped countless people around the world, and in 2009 he was awarded the title of “Young Australian of the Year. In 2011, Sam established Caring For People, a charity which seeks to promote basic human rights for people living with a disability. Sam has been invited to join the Yogi Times’ “I AM DOING IT” project and in the following interview, Sam shares with us his thoughts on resilience, self-doubt, and what keeps him motivated to follow his dream. Yogi Times: You’ve recently been invited to join Yogi Times’ “I AM DOING IT” project – What made you decide to start “doing it” with us? Sam Cawthorn: I have a very strong heart and a very strong passion for adding value to people’s lives in a positive way. One thing I love about Yogi Times is the outreach that it has to help other people, to make a difference, and this completely aligns with my value system and my dreams and goals. If I am doing it, then other people can do it as well. 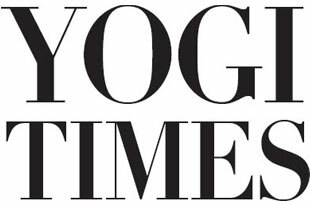 If I can make a difference just to one reader, just to one person within Yogi Times, then I know that I am serving my purpose. YT: What do you think is the most important contribution you are making to your community? Sam Cawthorn: My community is humanity. I’m a human being, so my community is humanity. Our community should not be determined by where we live in the world. We are all part of our community, we are all part of an organism. So for me, I know that the most important contribution that I’m making is helping the true poorest of the poor, which are the kids that live with disabilities in developing worlds. YT: What brought you to the path that you are now currently following in life? Sam Cawthorn: I’ve always been very motivated. I like keeping busy. Then I had my major car accident – a 206km head-on collision with a semi-trailer truck. It was my fault. I fell asleep and I veered over the other side of the road. I died at the scene, was later resuscitated, was then on life support for a week, in hospital for 5 months and in a wheelchair for a year. The doctors said I’d never be able to walk again. This whole accident experience definitely was the catalyst to create the life that I now live. I live a very grateful life. So I always look at ways where I can add value to other people’s lives. YT: What do you feel has been the most rewarding aspect of your work? Sam Cawthorn: The most rewarding aspect of my work is feedback, which is how I measure my results. I want to make sure that I’m adding value to people’s lives. The most rewarding aspect of this is when I get e-mails, phone calls, SMSes from people saying “Hey Sam, you’ve made such a difference in my life!” When I get that type of feedback, it’s rewarding. I know I’m making a difference. The most rewarding aspect of my work is knowing that I’ve made a difference. YT: What has been your biggest challenge so far in pursuing the work that you are doing? Sam Cawthorn: Even though I’ve spoken about my accident, and overcoming adversity because I now live with only one arm and a completely disabled leg, that was not my biggest challenge. My biggest challenge was my younger brother, David. He is my best friend in the world and I love him so much. Recently he was diagnosed with cancer. It was very hard seeing my 19 year old younger brother go through chemo, radiation, and lose all his hair, but I suppose the best news was that I had the same blood type as him. So I donated my bone marrow to my brother. We all believed he was going to get through this, but unfortunately, he did not. He passed away and it was really sad. It was the biggest challenge in my life so far, in pursuing my work. We all have adversity, we all have down times, and there is a time for grieving and sadness, but there is also a time for us to pick ourselves up and continue to move forward no matter what. YT: What has helped you handle this challenge? Sam Cawthorn: One of the greatest things that helped me handle this challenge was my faith. I have very strong faith. For me, it’s using God or the Universe or whatever you believe in to help you through these challenges in life. And when my brother passed away it was very, very hard, mentally, psychologically, and spiritually. The biggest thing that helped me get through was the faith that I had. But also another thing that’s really helped me handle challenges is the company that I keep, my relationships, my wife, my friends, and my family. YT: What do you think is the reason why your efforts have been successful in reaching people around the world and inspiring them to overcome their obstacles? Sam Cawthorn: I’m a resilient speaker so I specialize in resilience and overcoming adversity, specifically around motivation and inspiration. I talk about “bouncing forward.” We all talk about bouncing back, how we’re bouncing back from the global financial crisis, how we’re bouncing back from natural disasters, how we’re bouncing back from terrorism – we all use this term. But I have a problem with the term “bounce back”. So I don’t talk about bouncing back. I talk about bouncing forward into what we can become. I’ve now written two books on the topic of bouncing forward. I love arming people with the right type of tools, strategies, and systems so they can overcome their own obstacles in their own lives. So it’s all about not about bouncing back, but bouncing forward. YT: Sam, you are the father of three young kids, a husband, and at times you give speeches in different countries within the same week, how do you maintain a sense of balance? Sam Cawthorn: One of the best ways for me to have a good solid work/life balance is having a third space. A third space is this – it’s outside of work and it’s outside of home and being a father and a husband. It’s a space where I recharge. It’s a space that helps me to continue to operate on the high energy levels that I always operate in. A third space for people could be golf, it could be reading a book in a hammock, it could be watching a movie, it could be going for a walk outside with the dog – whatever that might be, we all must have a third space in our lives. My third space is watching movies. I would watch one movie a week sometimes. I sit down in the cinema, switch off, and just be entertained while eating ice cream. So the best way I can encourage people to have a sense of balance is having a third space. Time out from home and family, time out from work and a busy lifestyle. Time just for yourself. YT: How do you handle it when you’re having a bad day? Sam Cawthorn: I have never ever had a bad day for the last ten years. I might have bad moments that might last maybe 1 or 2 or maybe even3 seconds but I’ve now programmed and conditioned myself to no longer focus on the bad things. Even when my brother passed away, and on the day of my accident, it was not a bad day. Because for me, it’s all part of our journey, it’s all part of our destiny and it’s made us who we are today. So I’ve never had a bad day. There’s a thing called cognitive dissociation. If I close my eyes I can still feel every single one of my fingers and my wrist and my elbow as if it’s all still there. But it’s not. My arm was amputated. So I live with a thing called phantom pain. It’s very painful. Sometimes it will wake me up in the middle of the night because it’s so painful, but I’ve conditioned myself to no longer focus on this. Imagine the worst pins and needles you’ve ever had in your entire life. Times that by 100. That’s how my arm feels 24 hours a day, 7 days a week. I’ve conditioned myself to no longer focus on this. I believe we can all do that, no matter how many bad moments we have, we can condition ourselves to look at the positive because crisis creates opportunity. YT: What’s the best piece of advice you can give to anyone struggling with self-doubt? Sam Cawthorn: The best piece of advice I can give anyone struggling with self doubt is something I like to call “Proximity is power”, which is one of my bounce forward principles. “Proximity is power” means this – there’s a long line of research that says you are the average of your five closest friends. The company that you keep determines who you are. The study also shows that it’s the same with our weight, with our bank account balance, with our energy levels, our happiness levels. We are the average of our five closest friends. So the best piece of advice I can give anyone at all struggling with self doubt is to start hanging around with positive people, people that’ll influence you in a positive way. There’s so much self positivity that you can give yourself but it’s way more powerful if you surround yourself with people who inspire you, people who encourage you, people who will lift you up. The best advice I can give is to surround yourself with the best proximity. YT: How do you want to be remembered by all those whose lives you’ve touched in one way or another? Sam Cawthorn: The greatest way that I want to be remembered is by knowing that people have changed positively after they’ve heard or read or been in contact with me in any way, shape or form. My purpose is to add value to people’s lives in a positive way. And if I know that I’ve added value to one person’s life, I know that I can put my head on my pillow and know that I’ve been a faithful servant for today, for the Universe, for God, or whatever you believe in. I want to be remembered knowing that I have added value to people’s lives. YT: If you were to leave your body tomorrow, what have you not accomplished yet? Sam Cawthorn: I believe that what happens in the universe is perfect, which means that everything that I’m meant to achieve up until this moment in my life, I have achieved, and everything that I’m not meant to achieve, I haven’t achieved it yet. I am just a vessel of this universe, so I don’t want to live in regret if I do die, thinking “What haven’t I done?” I want to live in the present. I think too often we try to live in the future. We always try to focus on where we’re going, what the future looks like, instead of really realizing that everything that we’ve done, everything that we’ve achieved right now has brought us here. However, in saying that, I still have goals, dreams and aspirations, but I don’t want to feel as if I haven’t achieved everything that I’m meant to achieve. YT: You told us that you get a kick at practicing “random act of kindness.” Can you elaborate? Sam Cawthorn: There is a lot of research that shows that when we are kind, when we give, when we are generous, that actually can ignite happiness, positivity, energy, focus level, the whole lot. I think the way that I’ve been created has enabled me to enjoy giving more than receiving. For example, if someone gave me a Ferrari, I would much rather give a Ferrari than receive a Ferrari. I suppose I would get more joy by giving – there’s something in my psychology that says it’s not about me. I am obsessed with kindness and adding value to people’s lives. I believe that this obsession is inside everyone and most people have yet to realize what that means in their own personal lives. YT: Any last word of wisdom? Sam Cawthorn: You have to look at a momentum based approach. If people need a transformation, if people need a breakthrough, it doesn’t necessarily just come from reading an article, or from watching a video or listening to someone speak or a motivational quote. If you want long term positive behavioral change, you need to look at a momentum based approach which means hanging around with the right type of people that can constantly feed positive vibes your way. Looking at a constructive program that will keep you disciplined for a long period of time, long enough for you to look at long term positive change, will help. Sam Cawthorn has developed a 12 day challenge to break through anything in life. Find out more on Sam's workshops and books - samcawthorn.com.